Lady and the Blog → Living → Product Reviews → For Kids → Looking For A Great Game To Play With A Preschooler? Uno MOO! 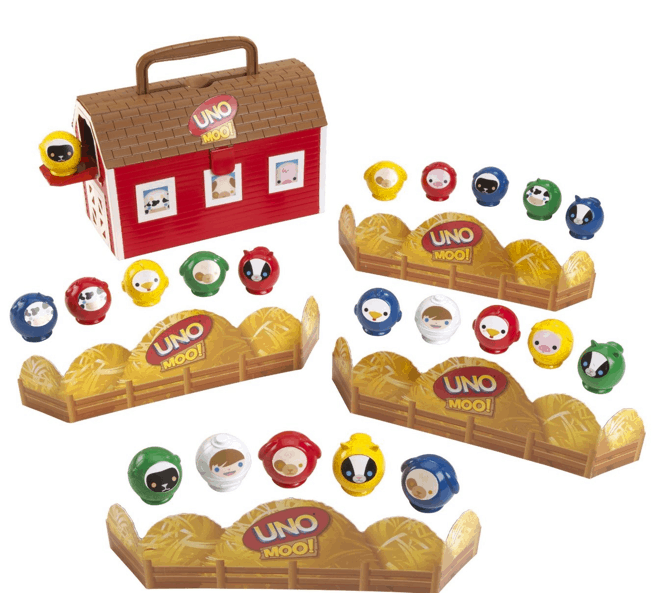 Every night after dinner, the family sits down for a game of UNO MOO Preschool Game . My 3 year old Liam is IN LOVE with the game and my 5 year old Natalie feels the same exact way. Are you looking for a game your preschooler will enjoy? UNO MOO! is easy enough to understand for everyone. You have to either match animal type or color. The first person to get all their animals back into the barn wins. There’s a few twists – the farmer is a wild card and the skunk is a penalty. So the kids really get excited when one of those items are drawn. UNO MOO! is a HOOT – give it a shot if you are looking to add to your game night collection. Who know Uno for kids would be so much fun! A is going to be 2 next month do you think this would be good for her or is she still too young? It would be a great gift for us to get her to play w/her older brothers who love to play w/her. but if someone helps her out as a teammate i would say it would be a good game. no other game works for us –so i had to share. we’ve bought SO MANY because I am a board gamer at heart.